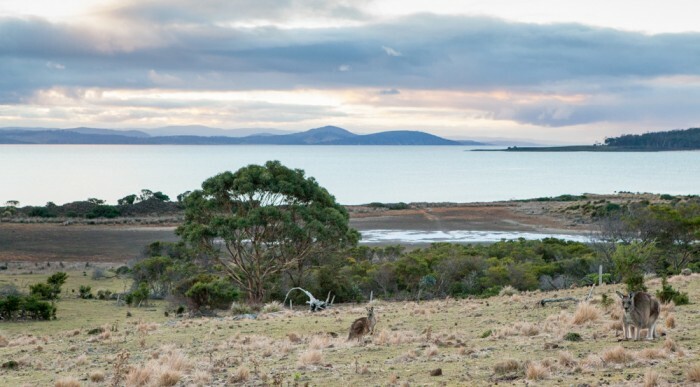 Located 10km south of Maria Island’s Darlington Township, the 2 hour Point Lesueur circuit reaches some of the Island’s lesser known convict sites. The highlight of the walk is the large Separate Apartments Probation Station ruins, set against a stunning coastal backdrop. Access to the Point Lesureur walk is best achieved as a day walk by cycling the coastal road to the trailhead. Alternatively the walk can be done as an easy 24km overnight walk. 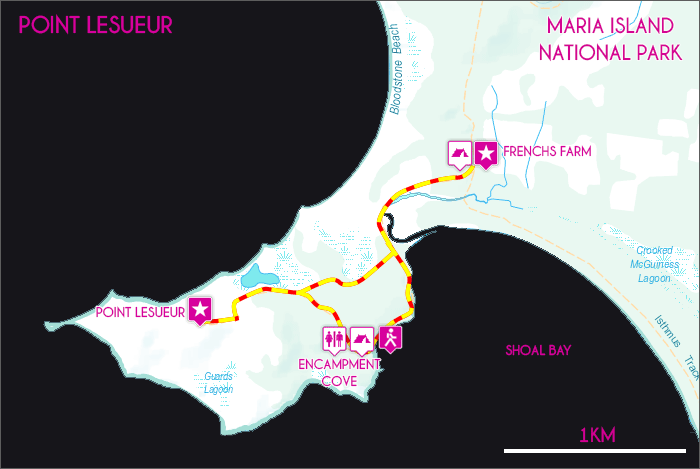 Once on Maria Island the Point Lesureur walk is accessed via the 10km coastal road from Darlington. Access to the start of the Point Lesueur walk is best achieved by cycling the 10km coastal road from Darlington to the southern coast of Maria Island. While this route can be walked, it is quite tedious, taking 4 hours to reach Encampment cove. Aside from the abundance of wildlife (wombats and bennett’s wallaby especially) the coastal road offers little of interest. Once at southern end of Maria Island there are two camping options for those wishing to stay overnight; Frenchs Farm and Encampment Cove. The campsite at Frenchs Farm offers low impact camping with limited facilities. It is a fuel stove only area and water is available from the tank adjacent to the farm house. 30 minutes further south, Encampment Cove offers a number of established campsites. Fires are allowed in designated fireplaces and water is available from taps throughout the grounds. From the Encampment Cove the Point Lesuesur circuit heads west past the rangers hut to a number of convict ruins. The trail is easy graded and undulates over gentle hills before descending to the ruins area. The view from the above hill is spectacular, offering a sweeping look at the mainland’s south east coast. 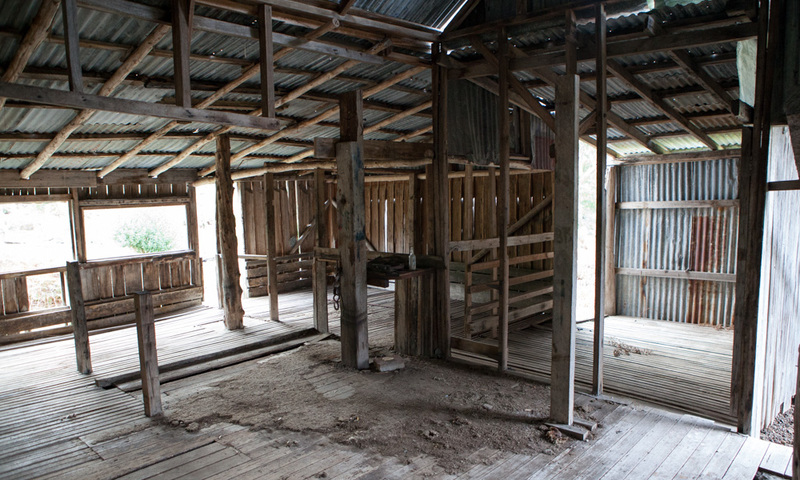 The first and largest ruins met are those of the Separate Apartments located to the west. Used as a probation station in 1845 these red brick ruins once housed up to 336 men. Now only a few cells remain intact. From here the trail deviates southwest to the barn and mill ruins on the furthest reach of Point Lesueur before continuing north towards the wetlands. Leaving Point Lesueur the trail continues via an overgrown road, passing a series of lush lagoons often teaming with birdlife. After passing the wetlands the Encampment Cove junction is met. From here the trail can be extended 40 minutes to reach Frenchs Farm or return to Encampment Cove by continuing right at the junction.